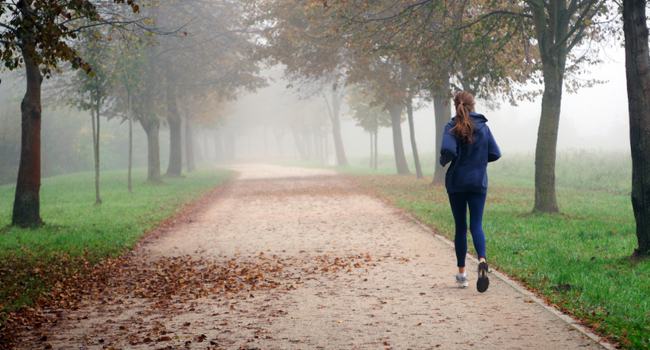 As the days get shorter, we all need to pay attention to our personal safety when out running. Here’s our advice for anyone running outdoors this month. The golden rule of running safety whether running on roads, pavements or footpaths is to be seen. You might not be running in the dark. But low light, poor light, dawn, dusk or misty Autumnal weather demand extra safety measures. Don’t assume that drivers, cyclists and pedestrians have seen you. It’s your responsibility to be visible and to pay attention to traffic, activity and other road users. Did you know that you should always run (and walk) facing incoming traffic? There are still a few runners who are unaware of this simple rule of the road. So, in the UK, this means running on the right hand side of the road, so the traffic closest to you is the traffic coming towards you. Run on the left, and you’ll have traffic coming up behind you (and potentially idling behind you as it waits to pass). Run on the right to be safe and compliant. Never run dressed in black. Wear light colours, high visibility items of kit, and reflective strips or panelling. Most leading kit manufacturers offer effective and good-looking winter running kit which is highly visible. Use it. If you’re running in very poor light conditions, consider wearing lights (you can buy running-specific gadgets which strap around ankles and wrists): remember to always have the red light facing back (just like in a car). Running in poor light does carry more risks than running in full daylight, so cover your bases. Make sure someone at home knows where you’re going on your run, how long you should be out for, and when to expect you back. It’s unlikely that you’ll have an accident, but it is far better to be safe than sorry. Every runner should carry ID in case the worst should happen. There are several specific products available for runners, which fit neatly onto shoelaces or around wrists, and carry enough vital information (name, emergency contact, medical details). We like the Cram Alert tag, developed by legendary Olympian Steve Cram (MBE). Never leave home without your runner’s ID, regardless of the time of year or length of run. It’s a no-brainer. Finally, never assume that other road users have seen you or are aware of you. If in doubt, assume that they can’t see you. Don’t take risks, be extra vigilant when running around corners, crossing driveways or openings to properties, and when crossing roads. Never run through red lights and don’t run across a road unless you are certain that it’s clear. Stay super-alert around all other road users: motorists, cyclists, motorcyclists, pedestrians, dog walkers, horse riders. Your safety is your responsibility – and we want you to stay safe throughout a lifetime of running!